i have been thinking for a while about writing here about what i write about here. (poorly written sentence, but hopefully you track with me). i know i have friends from all different seasons and parts of my life and not everyone shares the same faith in Jesus that is so central to my life. 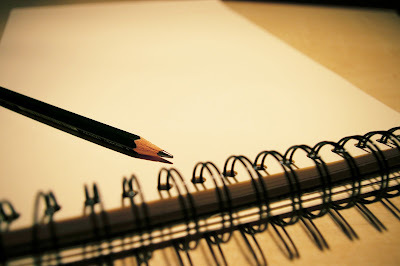 i realize that many may not connect with the fact that so much of my writing has to do with things i feel God is teaching me about life and so much has to do with scriptures from the Bible. so, since i know that everyone who comes to my blog may not share the same starting place in approaching what i write, i thought i would explain a bit. think of this as my version of an apologetic in very non-academic language. faith has an element of mystery to it. as much as i may try to explain where i am coming from and the perspective from which i see life unfold, there is no denying that i have to surrender to an element of mystery to believe in God and in the saving power of Jesus. so i know that i am not convincing anyone of anything that they do not choose to believe for themselves. i am not here to argue or debate, just to give a little background for why i choose to believe and why i write so much about my faith in Jesus. i was raised in a christian home, with my family largely either being from the fields of education or vocational ministry (ie. teachers and preachers). i guess you could say i got a little bit of both of those fires in my bones. even though i was very influenced by my parents and those influential in my life teaching me the truths of the Bible and the reality that relationship with the Creator God was possible and accessible for me, i had to still come to the place of decision for myself. i chose to begin an active relationship with Jesus, who i believe to be the only Way to know and experience God, when i was very very young. however, this decision was one i had to confirm over and over again when life circumstances would come and cause me to reassess what it was i would really believe and actively pursue for my life. this knowledge of God that i started pursuing was not only a knowing about God, but an experiential knowledge as well. i have had circumstances, both as a child and an adult, of facing extreme battles with fear and having an angel from God show up in my room to melt all fear of calamity away. i have heard the whispers of God on my heart both fully awake and while i sleep. i have had a very active dream life where God has spoken to me about things in both symbolic and very literal ways, including showing me my niece havyn in a dream before she was born (and while i was still convinced she was a boy because we hadn't found out her gender yet). i have seen visions of many things and had the Lord speak to me clearly regarding direction for my own life and specific things going on in the lives of others around me so that i could encourage them and pray for them. i have both seen angels and smelled the malodorous demons with my natural senses. all of these "spiritual" experiences have led me to an indescribable hunger and desire to know Jesus, the Creator and God of all things. I have been awed at His wonders and amazed at His nearness in the very real humanity He has cloaked Himself in forever. i believe He is the most proper noun that exists - the very God forever come to us in a form we would allow to draw close to us and teach us about the Uncreated Father and All-Consuming Fire. i have fed myself in all extremes of circumstances, for the past 25 years of being literate, on the Word of God - the bible. i quote it so much in my writings because it has become an anchor for me and such a source of wisdom and revelation. my prayer life has become the first place i run when i face both the highs and lows of life. more than anything else, the experience of real true forgiveness through Jesus for all of my sin, all of my shortcomings and failures and selfishness, from the only One who is perfect and without sin has completely changed my life. i have so much hope. i know that my salvation in a world so full of calamity and rumors of calamity isn't up to me. i believe that God is always good, full of grace and mercy... slow to anger and abounding in love... yet absolutely righteous and just. it is amazing that this good God who is perfect and holy, unlike anything else, would love me and want to know me personally and want to reveal Himself to me. i am amazed that He sent His very Spirit, the Holy Spirit, to live inside of me because i chose to give my life to following Him. i am never never alone. i cannot help but want to share what i have been given because i really believe, not it an weird salesman way, that if someone experiences His love and kindness even in the worst moments they will feel the same way i do. this is why i write so much about this relationship with God. i am so forever changed and continually amazed that His love is not put off by even the worst version of me. who could have ever imagined that in all of mankind's searching and stories of a hero that there really is One. so, i hope that even if you do not know Jesus in the way that i know Him, you will feel welcome to read this blog and take from my life experience. if anyone ever has any more personal questions about my faith than you would like to post here as a comment, please contact me and i would love to talk. this is so largely intertwined into who i am that it is what i think about, and what i end up writing about. most of all, i want to be a vessel of His love that others, whether they have personally experienced Him or not, may know that there really is Hope and there really is a love that never fails. thank you all so much for the ways you have blessed and enriched my life and journey, whether you realized it or not. i made an amazing soup a couple days ago after roasting our pumpkin and getting 11 cups of pumpkin puree from one pumpkin! here is a link to my favorite recipe site online called simply recipes. it is a blog and everything i have made from there, well over a dozen different things, are now family favorites and i have made all of them again and again and again. this spicy pumpkin soup will be one of those family favorites in the fall time. yummy! we cut all of our boys hair this weekend. well, my brother nathan actually cut their hair. asher, my 5 year old, has had a forever obsession with my brother as his hero. sunday morning he was looking at old family pictures with me and saw some of when he was a baby loving on his uncle nathan. he asked me, "mom, why do i love uncle naynee so much?" i asked him why, knowing his reasoning was bound to be classic. he responded, "i think it is because we have the same hair." he is obsessed with having his hair look like my brother's, even down to putting product in it in the morning and styling it the same. so funny. since we did haircuts, my sweet uriah with the surfer blond long wavy "crazy" hair decided to go with the more "cool look" and opted for rock star hair. (basically uncle naynee style). so... his beautiful locks are gone, making the number of occasions on which i am told i have a beautiful little girl greatly decreased. (terrible huh? he would get so mad!) he was so excited and proud of his new hair style. however when we got home and it was time for bed he told me tearfully, "i don't want rock star hair anymore!" i asked him why not and he said, "i want my crazy hair!" oh my. the indecisive 3 year old. so i guess we are potty training david. this decision is quite unofficial, and mostly because he has been wanting to sit on the toilet once a day and actually goes. he is very influenced by his girl cousin havyn, who is completely potty trained and in undies but only 6 weeks older than him. i have no desire to potty train a 20 month old, but the money saved from not having to buy diapers and wipes... well, even i am tempted in ways i don't know how to resist. finally, a passage i was reading... how could i ever end a blog without bringing up scripture, you may ask?!!! but really, this is good stuff. i was reading psalms 73 and it is all about how the guy who wrote the psalm was getting envious of all the stuff everyone else had as far as material wealth and apparent ease of life. he was especially envious of the wicked, who had no fear of God and took advantage of everyone around them but seemed completely unpunished in their ways. then he looked at his life: he tried to obey and follow God and struggled so much with nothing coming easily. sounds kinda familiar to this gal right here at times. as i read i was thinking... how many times is that so true and so unfair! what is up with that? how is it that those who try to follow the Lord and do what is right seem to have tough times and those who do everything the wrong, dishonest, selfish way seem to coast through life? (of course this is an exaggeration, but go with me here) then the end of the psalm hit me as i kept reading: they don't go unpunished. life doesn't end here in these 70 or 80 years (psalm 90) we may be around to enjoy. we will all stand before our Maker one day and have to give an account of our lives and on that day i want to be found faithful to Him. the trials i may or may not have had here in this life won't matter as much as the fact that i have a relationship with the Almighty God. all the things of this world... sure they make life easier. i am not going to have you believe that i wouldn't love a bit of easier. i would love a bit of ease some days! of course there are seasons where things seem a lot harder or easier than other times, but the fact remains that all this stuff here ends. when everything else fades away, all that matters is i have Him. this alone can get me through the really tough seasons of life. i went to a friend's house to collage one night, actually a week and a half ago on a thursday night, (i think that makes it on october 15th), and i was just too tired to stay and to really tear out enough pictures and words to cover a whole journal. i had come straight from worship practice and after substitute teaching in my son's kindergarten class for 2 days with another sub day early friday morning. 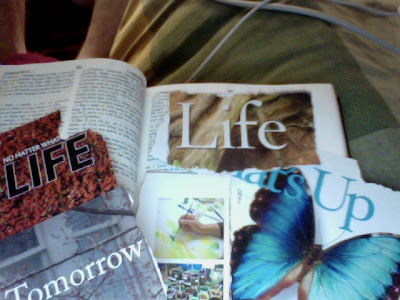 so, i took the few things i tore out and stuck them in the front cover of my bible. a couple things happened in the next few days to make me think briefly about looking at them again, but i didn't for whatever reason. this past sunday i was reading bible and decided to lay out the things i had torn out in front of me. there was a definite theme to my potential collage pieces. LIFE! i believe there is even one more word of life that isn't showing in the pic, but from what is showing the theme is clear. even the specific word tomorrow that i had torn out spoke encouragement to me about 2 distinct days that i had no idea i would be looking at these words and pictures right before. i love it when the Lord speaks encouragement to me before i know i will need it because He just cares that much. He often gives me the encouraging word before i know i am going to need encouragement at all and it is so amazing to look back at something that could not have been manipulated. God is just like that. LIFE and life more abundantly. 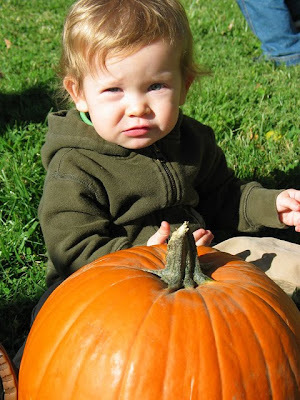 today is a special day for my blog - this is the 50th post! i guess i actually stuck with it long enough to get this far, which is really cool and in a way totally rewarding. i am no further on the book i am writing than when i began, other than narrowing down my topic, but i feel so much more ready to write. hey, i am writing! this may not be a book, but i am putting so much into words that i did not have words for before. what an amazing, and at times scary, experience this has been so far. writing is a strange thing. it is a great way to process all the thoughts and emotions that swirl around inside behind the frame of me that people can see, but it is at the same time scary for the very same reason. writing is so vulnerable because it exposes the very raw and intimate parts of oneself and sometimes i am not sure how much i want exposed. writing for me is part of the processing of life. i have found that sometimes words spill out onto the page that were not well thought out, but were the only way i could momentarily relieve some of the building pressure inside. i have at times looked back at what i have written and only understood it in the larger context of knowing the surrounding events at that time of my life. written words have served as markers for points of my life and i am taken right back to the very context in which they are written even reading them again many years down the road. and yet there are times when i have been going through sometime very hard in life and i have found that i have stopped writing in my journal, for sometimes quite large stretches of time, because i am afraid for even my own eyes to have a glimpse of the true state of my soul. imagine that dynamic to be ten times worse in blogging when the realization hits that who knows how many people's eyes will have a window to something i can't even bear to look upon myself. as great as processing may be, how much do i want to expose to anyone who may stumble across my way and how much access am i willing to give to my heart? that is not to say that every time i am not writing regularly that i am walking through hard stuff because i have found myself to be just as negligent in writing during the really good times. i often rely on my memory to soak up all the joy and bliss in situations and fail to realize that i could immortalize that feeling to revisit forever if i would only take the time to put it into written words. how quickly my memory fades, even as much as i would like to remember every last detail of those wow experiences. and now, as i have managed to remain completely vague while trying to express the feelings i have inside after hitting the big 50 mark on this blog. hopefully it is not just a bunch of nonsense thrown out there when i hit publish. here is to 50 posts. may there be 50 more to come that share a window into me while i walk the journey laid out ahead. last night was one of those nights after one of those weeks. thank God those do not last forever! i could not sleep. i lay awake thinking late into the night, which for me usually means worrying more than anything else. i actually thought about getting up to write on here, but when emotions are that raw, it is best that i talk to the Lord through it and let my tears spill out before Him first. sometimes things come up seemingly out of nowhere, and instead of try and run away from them (which i have been known to do many many times) i am starting to learn that allowing myself to feel them and turn to the Lord in the middle instead of denying their existence is part of the journey. so Lord, here i am, this is how i feel right now - right, wrong, or unimportant - and i am going to allow You access to the secret places in my heart that are so hidden that oftentimes i am not even aware that they exist. i did not get any profound answers or revelations and nothing in particular was fixed in the last 24 hours, but i feel so much better. i guess that is one thing about emotions - they come and they go as they please. feels much better to be on this end of it, but i think both sides are just as important. i am sitting in our prayer room at the watch of the Lord and watching a friend of mine paint on a canvas as my husband sings from the piano with a full band. the booming bass line shakes my very core with pulses of emotions deep down. instead of feeling overwhelmed with the problem and the emotions, i now instead feel overwhelmed with Presence. He is real. He really does care for me. and i am willing to take this journey, no matter what lies ahead, because i do not walk it alone. there is a good good God who loves righteousness and hates wickedness... and He cares for me.